The Monday/Tuesday overnight stop was at the Hôtel Le Vauban (32, Place du General de Gaulle) in Montreiul-sur-Mer (although despite the name it is now actually some miles from the sea! ), and in the morning we went for a walk around the walls of the medieval old town. We then headed for Dieppe, stopping en route at Le Crotoy, the port on the Somme Estuary from which William the Conqueror departed for England in 1066. 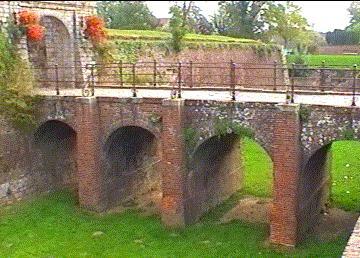 The walls at Montreuil-sur-Mer. 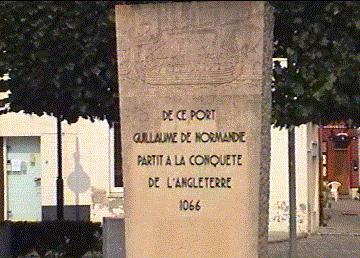 Memorial to William the Conqueror at Le Crotoy. Just to the North-East of Dieppe, in the shadow of a modern nuclear power station, a shingle beach lies beneath cliffs atop which is sits the village of Berneval-sur-Mer. On 19 August 1942, the Allies launched Operation Jubilee, a "reconnaissance in force" to test the German defences at Dieppe with a frontal assault on the port. On the left flank, a small attack was also made by No. 3 (Army) Commando on the German battery at Berneval, while on the right flank, No. 4 Commando targetted another strongpoint at Varengeville-sur-Mer. At the end of the day, only No. 4 Commando were wholely successful in acheiving their objective, although while not destroying the Berneval battery, the members of No. 3 Commando who did manage to scale the cliffs and attack it probably succeeded in distracting the gunners from the main fleet. Even so, out of 6,000 men of the 2nd Canadian Division, 4,300 were either killed, wounded, or captured in the main attack on Dieppe. Memorial to No. 3 Commando at Berneval-sur-Mer. 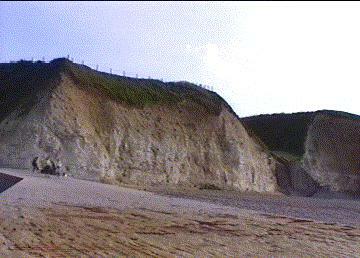 The cliffs from the beach. 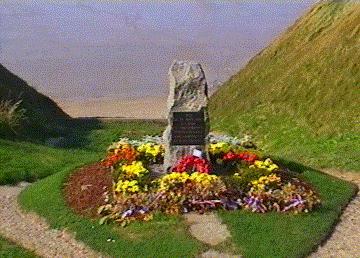 The memorial is at the top of the cutting on the right.